Jewish-affiliated camp, but everyone is welcome! Must register by June 4, 2018; register asap as certain weeks may sell out; to register, please email your certificate(s) with the name(s) of your children to gan@aju.edu. New campers only. If you are a new camper who has already enrolled in Gan Alonim for this summer, please call camp about this deal at (877) 225-6646. Jewish-affiliated camp but everyone is welcome! Day packed with horseback riding, sports, ropes course, swimming, music, art, and more! 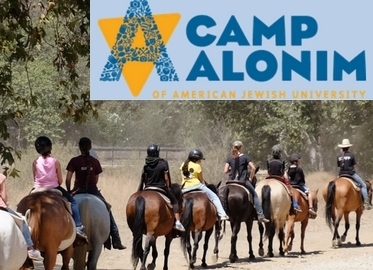 Visit alonim.com for more information and camp videos. Bus service available for $8 each way per day from Woodland Hills, Agoura Hills, Thousand Oaks, Encino, Northridge; or easy pick up and drop off at camp. Remember day camp? Where your day was packed with different activities the minute you arrived and didn’t stop until the day was over? Horseback riding, sports, swimming, music, art, and even a ropes course? Well, we are excited to report that Simi Deals has teamed up with one of the best day camps around, Gan Alonim Day Camp, to bring you today’s deal! Get either 3 days of camp for just $99 (regularly $177) or 5 days of camp for $159 (value $295)! Gan Alonim is located in the beautiful hills of Simi Valley on 2,700 get-away-from-it all acres. It is a Jewish camp, but absolutely everyone is welcome. You can drop kids off at 9:00 am and pick them up at 3:30 pm tired and happy, or you can send them on one of several camp buses. Activities change each day, but over the course of a week, kids will enjoy swimming in the life-guard patrolled Gan Alonim pool, horseback riding, sports, art, music, performing arts, and an incredible ropes course! You may purchase a certificate for each camper in your family! P.S. Wendy sent her kids to Camp Alonim (Gan Alonim’s sister overnight camp) and they loved it!